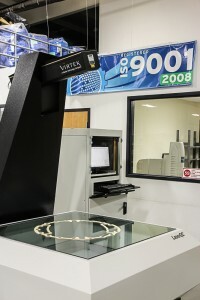 Non-contact part inspection is faster and more comprehensive than tactile techniques that use a probe to “touch” parts. 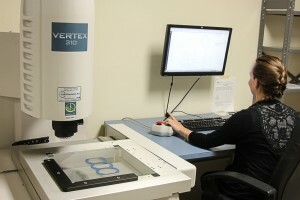 Contact-based measurements with a coordinate measuring machine (CMM) are accurate, of course, but the data collection is time-consuming. Non-contact inspection methods are faster. They also provide a clearer view of a fabricated part by collecting a more comprehensive set of data points. Interstate Specialty Products uses non-contact optical and laser inspection equipment to measure part dimensions and geometries. These non-contact inspection techniques help to ensure the accuracy and quality of your die cut parts for medical, scientific, electronics, and industrial applications. By achieving tight tolerances, our die cutting and digital die-less cutting services can meet the most demanding specifications. Automated vision systems that use structured lighting capture the three-dimensional (3D) shape of a die cut part by recording deviations in a projected light pattern. The non-contact optical inspection equipment that Interstate Specialty Products uses has a 18-channel lighting system, machine-side electronics, and programmable zoom lens. With its low level of measurement noise, our optical scanner is ideal for measuring smaller parts and components made of shinier materials. Interstate Specialty Products also uses non-contact laser inspection equipment to measure two-dimensional (2D) parts to tight tolerances. Before each scan, our laser scanner verifies calibration for repeatable accuracy. Our non-contact inspection system captures more than 500 data points per second, and is accurate to within 0.05 mm or 0.002 inches. Quality control reports are generated automatically. Interstate Specialty Products is ready to answer your questions about non-contact inspection technologies, and to recommend optical or laser scanning for quality assurance at our Made in the USA manufacturing facility in Sutton, Massachusetts. To learn how our custom manufacturing and quality assurance capabilities can support your application, contact us on-line or call (800) 984-1811.